30 DAY No Risk Satisfaction If you are not completely satisfied with the Performance of Your DEWALT product, simply return it within 30 days, complete as purchased, to the point of purchase, for a full refund or exchange. Proof of purchase must be produced. Excludes accessories or spare parts unless failed under warranty. 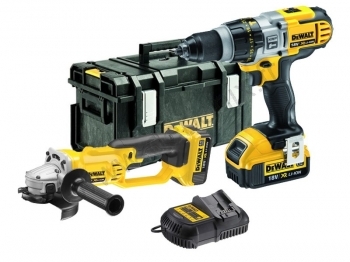 1 Year Free Service Contract If you need maintenance or service for your DEWALT product in the 12 months following purchase, it will be undertaken free of charge at an authorised DEWALT repair agent. Proof of purchase must be produced. Includes Labour. Excludes accessories or spare parts unless failed under warranty. 1 Year Full Warranty If your DEWALT product becomes defective due to faulty materials or workmanship within 12 months from the date of purchase, DEWALT guarantees to replace all defective parts free of charge - or at our discretion - replace the unit free of charge provided that, the product has not been misused, the product has been subject to fair wear and tear, repairs have not been attempted by unauthorised persons and proof of purchase is produced. In order to make a claim, you will need to submit proof of purchase to the seller or an authorised DEWALT repair agent, and the product must display the CE mark. Comprises high powered XR combi drill with all-metal transmission and powerful 5" angle grinder with high torque, low profile magnesium gear case and keyless guard for versatility. Supplied with 2 x 4Ah Li-ion slide batteries, 1-hour charger and heavy duty carry case. DCD985 combi drill, DCG412 grinder with multi-position side handle, 2 x 4Ah Li-ion batteries, charger, protective guard, spanner and carry case. Combi Drill: Max. drilling capacity in masonry 16mm, wood 50mm, steel 13mm. Max. torque 81Nm hard / 55Nm soft. No load speed 0-575 / 0-1350 / 0-2000. Overall length 238mm. Weight 2.42kg. Angle Grinder: Disc dia. 125mm x 22.2mm bore. No load speed 7000rpm. Spindle thread M14. Overall length 400mm. Weight 3kg.